Traditionally made with butter, cream, sugar, golden syrup, and white chocolate to give a creamy melt in the mouth texture. 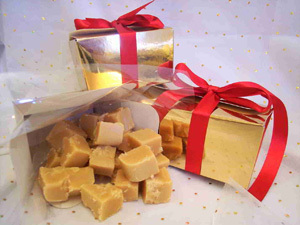 White chocolate butter fudge gift wrapped in a gift box tied with ribbon. Note box design may vary according to stock.